As an ensign, Lavelle shared quarters with his friend Taurik on board the Enterprise-D, something he was not always happy about. He was also the conn officer on the alpha shift. Besides Taurik, his circle of friends included Nurse Alyssa Ogawa, Ensign Sito Jaxa, and Ten Forward waiter Ben. The group had regular poker nights, sometimes including Ogawa's fiancé, Lieutenant Andrew Powell. Powell was one of the worst poker players that Lavelle had ever met. Lavelle was career-oriented and driven and most wanted a promotion. In 2370, he was up for the operations officer position, in competition with Sito Jaxa. Although he was the obvious choice for the promotion, his uncertain relationship with his commanding officer William T. Riker somewhat got him off to a rough start. Lavelle was always nervous around him and Riker took the opportunity to criticize small issues, to Lavelle's general embarrassment. Lavelle's friends thought he was just imagining the situation, but Lavelle believed that Riker did not like him and had it in for him. Even though Lavelle tried to get on Riker's good side and had an immense amount of respect for him, Lavelle believed Riker to be uptight, once stating that Riker probably slept in his uniform. Ben once encouraged Lavelle to introduce himself and get to know Riker. However, Lavelle's interaction with Riker was awkward and short-lived: on the basis of erroneous information from Ben, Lavelle had believed Riker to be from Canada, like his own grandfather, and struck up a conversation with Riker. But when it turned out that Riker was actually from Alaska, a much embarrassed Lavelle quickly retreated, regretting having once again said the wrong thing. Lavelle was sure that he would not get the promotion if it was up to Riker. Riker saw these incidents as no more than attempts by Lavelle to ingratiate himself. However, Counselor Troi pointed out to him that he and Lavelle were a lot alike and that Riker should not hold Lavelle's inexperience with such matters against him. Troi's advice convinced Riker, who decided that he may have been too hard on Lavelle, however, Sito got the operations job. This refocused Lavelle who worked with Lieutenant Worf and transferred to security. After the destruction of the Enterprise-D Lavelle was assigned to the Enterprise-E as Assistant Security Chief where he served for about a year before transferring to the Robert E Lee as Security. During the Dominion War in 2374 Lavelle was reassigned to the Aizawa to be the ship's Second Officer. 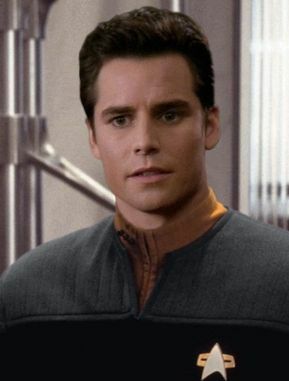 After the ship was decommissioned Sam was hopeful to get a First Officer but ended up taking the Second Officer position on Voyager.